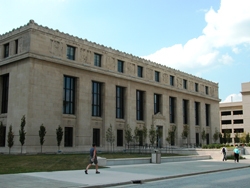 Indiana State Library and Historical Building is one of the most significant works of Pierre & Wright, an important architectural firm in Indianapolis during the second quarter of the 20th century. Its distinctive architecture combines Neo-Classical features with Art Deco detailing. This style of architecture, termed Stripped Classical Modernism, was popular for government building projects of the 1930s. The Indiana State Library and Historical Building is the only other historic building on the state capitol campus. The General Assembly established a State Library in 1825. The institution was to aid legislators in researching various topics. Eventually, room was made for the library and staff in the Statehouse. By the 1920s, the need for a separate building was so great that materials were being stored in hallways of the capitol. In 1929, the Assembly raised a special tax to fund construction. The project became one of few underway in the city during the dark early years of the Great Depression, when construction began in 1932. The Indiana limestone façade of the building is Classical in style, but with strong Art Deco influences. The exterior includes relief panels with different types of citizens: an explorer, soldier, pioneer, farmer, legislator, miner, builder, constructor, manufacturer, educator, and student. For the interior, Pierre & Wright specified sandstone from St. Meinrad, in southern Indiana, giving the walls a warm light tan color. The cascading stairs lead up to the two-story high circulation room. Murals, stencil work, stained glass, and rich oak make this room a tour de force of Deco Classicism. J. Scott Williams executed the stained glass and murals. Art Deco owl heads are hidden here and there in the main rooms. Indiana State Library and Historical Building is located at the southwest corner of Ohio and Senate, downtown Indianapolis. The Indiana State Library is open Monday, Tuesday, Wednesday, and Friday, 8:00am to 4:30pm; Thursday 8:00 am to 7:00 pm and Saturday 8:30am to 4:00pm, unless closed for a state or federal holiday. Visit the impressive main circulation room and murals.